Ms Ellis is one of those dynamic, sporty, hardworking and friendly ambassadors who is determined to put her country on the international agenda. Madame Ambassador has a difficult task because most people do not know very much about her country, apart from the fact that it’s on the other side of the globe. New Zealand is a major agricultural exporting country, mainly known for its dairy, meat and wool production. But did you know that it also publishes the UN Handbook, a long tradition that they have carried on for over fifty years. With a lot of work on her plate, Madame Ambassador speaks very highly of her colleagues in the diplomatic community of Geneva, and the quality of the work being carried out in the UN and the different agencies. She had previously worked in the World Bank and in the private sector, and she has written several books on entrepreneurship, on women’s economic integration and women’s role as agents in economic development. She is a fervent supporter of including women in development for the greater benefit of society. So now we leave the floor to Madame Ambassador. Q: Could you tell us something about your personal background? Prior to coming to Geneva, I was Deputy Secretary in the New Zealand Ministry of Foreign Affairs & Trade in charge of international development cooperation. It was a really rewarding role as you can imagine, and prior to that I had been working at the World Bank for seven years. My most recent role there was as lead specialist in the poverty reduction and economic management group. I also managed the World Bank President’s Global Private Sector CEO Forum, where the CEOs of some of the world’s largest companies, such as Exxon Mobile, Ernst & Young, Cisco, Standard Chartered Bank, Nike and other big multinationals, met regularly to discuss contributions to development. A particular passion of mine is how you can look at Official Development Assistance as a catalyst for long-term sustainable private sector development. I also observe a lot of interest in this issue among my African colleagues especially. Before joining the World Bank I worked in the banking sector. I started as Head of Communications for Westpac Banking Corporation Australia and I also set up the National Women in Business Unit and Women’s Markets. My team went from a standing start to generating over half a billion dollars per annum in business in just 3 years. When I went to the World Bank I persuaded them to set up the first initiative on Women and Private Sector Development, which focused on the gender dimensions of public policy for PSD, and then at the International Finance Corporation the first ever lines of credit for women entrepreneurs in Africa. A $30m facility with Access Bank was launched with President Obasanjo in Nigeria. While colleagues were initially sceptical, it proved to be very successful and provided impetus for replication in a number of other countries. One of the roles I have here is to be a Special Envoy of the New Zealand Prime Minister to francophone Africa, as New Zealand is taking very seriously a bid for the Security Council in 2015‒2016. As the majority of the Council’s work is in Africa, our focus and preparation is particularly important. In learning from and collaborating with my African colleagues, it is very much New Zealand’s desire to see greater attention paid to the root causes of conflict, and to the intersect between conflict, security and longer-term peace and development. I was very pleased to see that the High-Level Panel’s report to the Secretary-General on the post-2015 development agenda has five transformative shifts, the third of which was the idea of the intersect between security and development which didn’t feature in the Millennium Development Goals. I think it’s a very exciting time to be here in Geneva where the post-development agenda is very much at the heart of everything we do. New Zealand is a small state with an independent foreign policy and a commitment to being a good international partner, and we last served on the Security Council twenty-one years ago. Now is the time to start thinking about the new Security Council for 2015‒2016 and how we can play a role in long-term development, as well as in peace-keeping, where we have a strong track record of engagement over the last 60 years. Q: What is the UN Handbook? Could you tell us about it? The UN architecture is very complex and the handbook started quite simply with some New Zealand colleagues putting information together in a structured way as a reference tool. Other missions found it useful so every year now we do an up-date providing all the background and the history for committees at the UN. 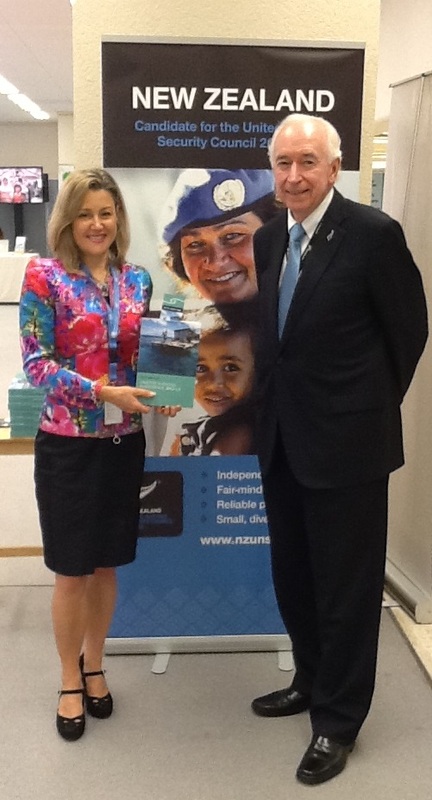 This year New Zealand will produce the 52nd edition of the UN handbook. It is simply a really useful background document. It is now also an on-line smart phone application, so you can download it. I think that in the context of the UN, the handbook is a practical demonstration of New Zealand as a small country making an enduring contribution that is appreciated by other colleagues. The AU and NZ partnered to produce a similar handbook for the AU for the first time earlier this year. Q: Many people do not know much about your country. Could you tell us something about it? New Zealand is situated geographically in the South Pacific, 3 hours flight from Sydney, Australia and comprises 3 major islands, with a land area of 268,000 km² and the world’s fourth largest EEZ of 4 million square kilometres. There are 3 official languages: English, Māori (the language of our indigenous people who comprise around 15% of the population) and sign language. The first thing people usually mention about New Zealand is the All Blacks rugby team and the haka (Māori war dance) performed before games, but innovation like our high tech special effects and New Zealand’s spectacular scenery shown off so well in the “Lord of the Rings” films also feature. And of course our excellent primary produce and award winning wines. Over 70% of our exports are agricultural so we are rather unique as a developed country. New Zealand celebrates its national day ‒‒ Waitangi Day ‒‒ on 6 February. It marks the signing of an historic partnership between Māori (who arrived by canoe around 1300) and “Pakeha” or Europeans, who began settling from the early 1900s. Māori were incredible navigators because they were able to use stars and travel over huge distances. Sometime later, Abel Tasman led an expedition of discovery and on 13 December 1642 sighted New Zealand and established a connection with the Netherlands. Tasmania, in Australia, is named after him. Then, in 1769 Captain James Cook explored the coast of New Zealand and mapped it. Subsequent to that sealers and whalers began to arrive because the seas around New Zealand were very abundant in marine life. As you can imagine, there was quite an interesting interface between Māori and European cultures. At the same time missionaries came settlers became interested as well and, of course, all kinds of battles took place between the early settlers and the Māori tribes. The French also came to the South Island, and it became something of a race between the British and the French to colonize the country. There was an agreement signed on the 6 February 1840 between representatives of all the Māori tribes and Governor James Busby, who was Queen Victoria’s representative at that time. That was really the official founding of modern New Zealand ‒‒ the founding document of a new nation and a partnership that set out on paper an agreement for going forward. In recent decades the Government has made significant efforts to ensure the partnership enshrined in the Treaty of Waitangi is respected and Māori is now accepted as an official language of New Zealand. There is an encouragement of Māori culture throughout our schools and mutual cultural respect. New Zealand is known for being the first country in the world where women won the right to vote, in 1893. Today we rank number one on Transparency International’s perception of corruption index (that is, least corrupt! ), number three on the World Bank’s Ease of Doing Business index, number four on the Global Peace Index, number five on the Heritage Foundation Index of Economic Freedom and number six on the UN Human Development Index. Q: Many tourists travel to New Zealand. What exactly do you have to offer? New Zealand is the most diverse geographical place in the world. We have everything from rain forest to desert, from volcanoes to fjords. Those who are interested in hiking, skiing and outdoor activities, such as fishing, are very attracted to New Zealand. Our indigenous Māori culture is a significant draw card. We also have a very good educational infrastructure and a lot of foreign students go to study and learn English. Q: What is the main focus of New Zealand foreign policy? New Zealand puts an emphasis on the multilateral system. As a small country, we recognize that it is very important for us to be involved as an active participant in international diplomacy. Thus, here in Geneva we have an ambassador at the World Trade Organization (WTO), and a disarmament ambassador based in our capital, Wellington, while I am head of mission and Ambassador to the UN and specialized agencies. For a small country to have that level of representation in Geneva gives you an indication of how important the multilateral system is to us. In terms of our priorities in Geneva, the WTO - where New Zealand chairs the agricultural committee - the Human Rights Council, World Health Organization and International Labour Organisation are of special interest, as well as the humanitarian organizations, such as the Red Cross, UNHCR and UNISDR given New Zealand’s situation on the “ring of fire” in the Pacific. I think for all small countries the multilateral system is particularly important given increasing globalisation. For New Zealand we put great store on regional and bilateral relations too. I think it’s important to have a seat at the table, because if you don’t you may end up on the menu! I think that is part of the reason why every twenty years the New Zealand Government has committed itself to offering our candidature to the Security Council. This is because we believe it’s very important to be engaged and to play our role. There are 193 states in the UN system, so we consider it as very important to be a voice for other small states and also to be sure that we can contribute in a positive way to UN reform in light of a rapidly changing global environment. It is critical for us. Q: What does New Zealand have to offer and which region do you consider yourself to be part of ‒– the Asia-Pacific or the European region? The UN is a very confusing animal because there are so many different groups and configurations. Although technically we are part of the WEOG, New Zealand sees itself geographically and culturally very much as part of the Asia-Pacific Region too. We are an island nation, a Pacific nation, so we do have a lot of things in common with our neighbouring states. For instance, Auckland, our major city, is the largest Polynesian city in the world, and there are more than 120 different languages spoken in our country. Q: Going back to the economy of your country, are there trade and industry domains other than agriculture? Because we have such a propitious climate, and very talented scientists and farmers, we continue to improve our productivity ratios in primary products. We have a unique system of fisheries depending on a quota management system. We have a very vibrant innovation sector as well, and are globally recognised in the creative industries too. You may have seen The Lords of the Rings or The Hobbit films, which were filmed in New Zealand with special effects produced there too. We also have a range of new businesses being created, for example high-tech in the health-care sector. There are a whole range of innovation and technology companies as well. Q: Europe suffered quite a lot during the economic turmoil of 2008. What happened in New Zealand? Of course, the global financial crisis impacted on our economy as it impacted on others. However, next year, our growth rate is predicted to be the fastest in the OECD, so we have been lucky to be relatively less affected than other developed countries. Part of this is due to prudent regulation in the financial sector, but even so as a small open economy highly dependent on international trade we were affected. The New Zealand Government managed its fiscal and monetary policies quite cleverly during the crisis. We borrowed as necessary, but will be back in surplus in 2014. Government made sure that the negative impact of the financial crisis on citizens was cushioned, but at the same time conducted a prudent fiscal policy so that we did not become too indebted. As an economist, I know how difficult it is to strike a balance. Our Finance Minister was very pleased with all the attention he received for this achievement at the Annual Meeting of the World Economic Forum at Davos in January 2014. Q: You are a trained economist and you have been very active in bringing women into the business world through your activities and achievements. Is there something similar going on here in Geneva? I am a very proud member of the Group of Women Ambassadors in Geneva, also known tongue in cheek as The Lipstick Club, that was started by colleagues a couple of years ago. It is a very collegial group and, of course, all our male colleagues want to know what we are talking about. It shows how far women have come when you can have a name like the Lipstick Club. It shows that there is no longer concern about taking ourselves too seriously. I think we are close to forty members now which I understand is more than the number of women PRs in New York. We collaborated together on a major event in the margins of the June 2014 session of the Human Rights Council as part of the “Power of empowered women” series, this year on women’s economic empowerment. I was very honoured to moderate a panel that included outstanding women business leaders from Afghanistan, Haiti, India, Uganda along with the Chief Economist of the World Economic Forum. As an economist with a special interest in private sector development I have written two books on women in business and entrepreneurship for Random House (which, to my amazement, both became best sellers) and I have also written five for the World Bank on women and their role as economic agents. One of the things we found through World Bank research is that there is a very high correlation between gender equality and economic growth. I think that this has helped to inform the policies of multilateral agencies trying to promote long-term sustainable development. Of course, the work done here through the Office of the High Commissioner for Human Rights and the Universal Periodic Reviews are looking at legislative frameworks and the human rights perspective to ensure non-discrimination. Along with the business case for women’s economic empowerment, is the rights based approach. What is fair? What makes economic sense? Ensuring women have the opportunity to choose to engage in formal economic activity is the right thing to do as well as the smart thing to do. The UPR process is an important means of exchange and interaction with other countries so we are able to learn from one another. There is a real commitment by Council members to look at improving the legislative environment with a view to creating better outcomes for citizens. It has been interesting for me to see that the economic work I did while working at the World Bank is actually very relevant here. One of the projects I started while at the Bank is now an annual publication, Women, Business and the Law, which compares countries on the basis of legislation to facilitate equal economic opportunity. Out of the 143 countries in the survey this year, 128 still have legislation that is discriminatory. This is a very useful input for the Universal Periodic Review process. For me, it has been fascinating to see how work carried out in previous environments is also proving useful here in Geneva. I’m also pleased to serve on the World Economic Forum Global Agenda Council on new growth models that incorporate development and gender equality. Q: Since you arrived, what has given you most personal satisfaction? Most personal satisfaction has come from my relations with other colleagues, the heads of agency and their hardworking staff and collaborating together to really help move important policy agendas forward in a positive way. New Zealand partners with Mexico on disabilities issues and with Burkina Faso and Colombia on maternal mortality in the Human Rights Council. Given my background as an economist and my involvement in development, in particular around the post-2015 development agenda and the peace-building agenda, my experiences with my African colleagues and also the Small Island Developing States group (SIDS), have been especially rewarding. Our own team here at the New Zealand Permanent Mission is really outstanding and I think my favourite team moment would have to be our Waitangi (national) Day celebration. Everyone worked so well together and we were all very proud to have such a wonderful turn out of colleagues attend. The quality and calibre of the colleagues here in Geneva is really outstanding; the way in which we work together is very collegial. Of course we all have different approaches based on our government’s perspectives and we try to respect these positions, while searching for common ground. It really gives you confidence in the value of engaging in a multilateral system with the intention of creating a better world. It is my first time in a multilateral post and I was at first a little reluctant to come. Now that I’m here I recognize just what value we are able to bring as permanent representatives to our work in the multilateral system. We can all contribute to a better outcome through our attitude and collaboration. It is a very rewarding environment to work in and being able to deal with the heads of agencies, all of whom are of a very high quality. It is a real privilege. Q: Diplomats and ambassadors serving in Geneva say that they acquire a very good experience here that serves them for the rest of their lives. Do you share this point of view? I think we are so fortunate to be here dealing with constructive and committed colleagues but we are also living in a privileged little bubble. It is often frustrating not to be able to achieve more when there is such immense suffering. It is a very steep learning curve because you have almost every country represented here and it’s a universal agenda. You have to learn to listen carefully and to respect other nations’ points of view to find constructive ways to compromise without losing sight of the key issues for your country. But I think that people come to the table with the right attitude and approach, so this is a propitious environment when trying to solve tough problems. We have to remain optimistic we can work together constructively for real practical outcomes.